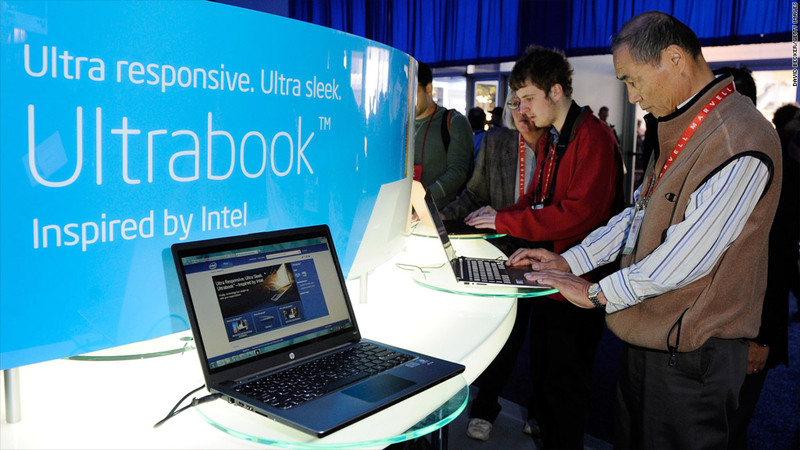 Touted heavily at this year's Consumer Electronics Show, ultrabook sales haven't lived up to expectations. One year ago, skinny, sleek ultrabooks were being hailed as the great savior of the struggling PC business. The white knight hasn't arrived yet. Ultrabook sales so far have sorely disappointed, and one research firm is slashing its 2012 forecast by more than half. IHS iSuppli laid out a stark view of the field in a report it cheekily titled "Dude, You're Not Getting an Ultrabook." The research firm now expects about 10.3 million ultrabooks to ship worldwide in 2012. Earlier this year, its prediction was 22 million. There are two key reasons for lackluster sales of the super-thin and super-fast notebooks, according to IHS iSuppli: "nebulous marketing and unappealing price." The company also took a shot at Intel (INTC), the creator of the "ultrabook" category, for its too-strict standards. The company's "increasingly stringent set of definitions" mean that some computers that were once called ultrabooks are now called "ultrathins" -- a new, unfamiliar bit of jargon in a field that already isn't doing well marketing to consumers. "So far, the PC industry has failed to create the kind of buzz and excitement among consumers that is required to propel ultrabooks into the mainstream," Craig Stice, IHS's senior principal analyst for computer platforms, wrote in the report. That's even more of a problem considering the marketing blitz around tablets and smartphones. A long list of companies have released shiny new tablets or phones recently: Apple (AAPL), Amazon (AMZN), Nokia (NOK), Microsoft (MSFT) and more. The report also criticized the $1,000 price point for most ultrabooks, saying that a cut to $600-$700 could spur sales in 2013. Intel has a lot to lose if ultrabooks don't take off. Consumer demand for PCs continues to slump, particularly in the United States, Canada and Europe. Intel heavily hyped ultrabooks, a word it trademarked, at the Consumer Electronics Show earlier this year, and predicted that ultrabooks would account for 40% of all consumer notebook sales by the end of 2012. Despite the slashed sales forecast, the ultrabook field still has a few bright spots. Intel is releasing a new microprocessor called Haswell in mid-2013. Microsoft's (MSFT) new Windows 8 operating system, due out later this month, could be another sales catalyst. It runs on both traditional PCs and tablets and will appear on ultrabooks from companies including Hewlett-Packard (HPQ) and Dell (DELL). Those moves could help ultrabooks pull out of their slump next year, IHS iSuppli said in its report, especially if pricing and marketing improve. The company predicted that ultrabook shipments will rise by more than 300% next year and continue growing to 95 million units by 2016.